This 31 tonne crane ended up partially off the road and leaning over. Both the front and rear axles were touching the road, the fuel tank on the nearside, which is about a meter off the floor, was touching the ground. 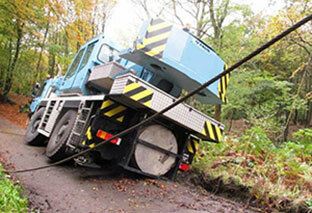 A 2 to 1 winch was set up from the Foden, which was set up behind the crane. The winch ran to 2 large tress in front of the crane. 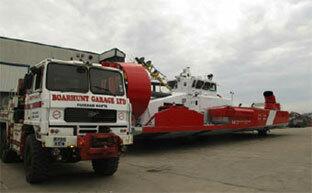 We recently assisted with the movement of a hovercraft that is featured in Channel 5’s mega moves series. The Canadian Coastguard hovercraft weighs 71 tonnes and required assistance to get up the slipway back onto level ground. Before this we set up the Foden to be used as a land anchor while they tested the engines. 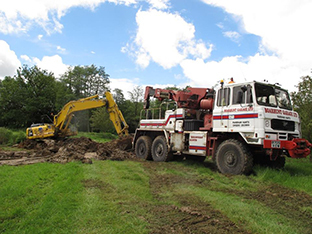 We were called to a 20 tonne excavator that had slipped into a lake and got stuck, it was an easy job for the Foden. 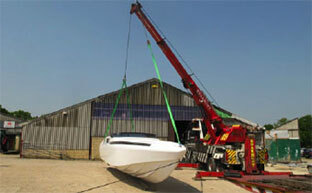 We were requested to load and transport a custom build racing boat to London. The movement happened two days prior to the race and the boat had not even had any sea trials! 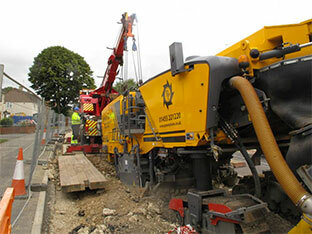 We were recently requested to recover a 50 tonne road planner that sank into a road in Southampton. The ground was so soft that we had mats placed along the road up to the machine to enable our vehicle to gain access to the planner. This took 2 days to set up. Once the pads were down, we attended and set up the Daf Rotator. We lifted the rear of the machine and placed mats under the tracks, The machine then tracked itself back onto firmer ground. 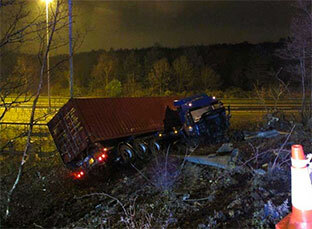 This truck left the M27 at junction 4 and went down the embankment. It ended up jack knifed with the o/s trailer wheels 2 foot off the ground. The biggest challenge was getting both sections of the motorway closed, the recovery was slow with several vehicle repositions but all went well. Thankfully the driver only suffered minor injuries.